Bruce Springsteen canceled a performance in Kansas City after his cousin — who also worked as an assistant road manager — was found dead in his hotel room Monday evening. A rep for Bruce confirms: "Lenny Sullivan, Bruce's cousin and the assistant road manager of the E Street Band for the past 10 years, passed away today at the age of 36. A warm and sensitive person, he was beloved by Bruce, the Band, the crew, and the entire Thrill Hill family." Sullivan was found dead at Kansas City's Intercontinental Hotel hours before Springsteen and the E Street Band were to take the stage Monday night. According to the Associated Press, Kansas City police spokesman Capt. Rich Lockhart said officers were investigating the death, which he said was not suspicious. 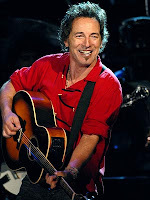 Tickets for Monday's show are to be refunded, and his rep said: "Bruce and the Band deeply appreciate the understanding of our Kansas City audience, and look forward to returning at our the first opportunity."